My grandfather taught me how to play chess at a very young age. He would without fail always win and then would say – “Christopher, you need to be thinking three moves ahead.” As I evolved, feverously thinking three moves ahead, he would continuously win, and at the end would say – “You need to be thinking five moves ahead.” As a young kid this was both infuriating and equally eye opening. Once I mastered the five moves ahead, and with a sense of pride as I took his queen, he gently leaned forward and said – “Well done. But you need to be thinking seven moves ahead.” As work and life sometimes get the best of me, or at least consumes most of my time, I now often think through the entire week’s potential menus over the weekend knowing that I will have less time on weekday nights to concoct something complex and fine restaurant worthy. However, like many restaurants and hotels, thinking seven days ahead means using “every part of the buffalo” and leveraging every nibble of leftovers which can be the center of something new and delicious. These empanadas were a happy treat, and filled with pulled pork from our annual pig roast, and the gruyere cheese added a distinctive layer of earthy flavor. I never did beat my grandfather at chess, but his life lessons made me who I am today, and my final move has yet to come. In a large bowl, blend cream cheese and butter until smooth. Sift flour and salt into same bowl and mix until mixture resembles coarse meal. In a small bowl, beat together egg, 1 tablespoon of water, and the vinegar. Add to flour mixture, stirring until just incorporated. Turn out mixture onto a lightly floured surface and gather together, and then knead gently just enough to bring dough together. Form dough into a flat round and wrap in plastic wrap. Chill for at least 1 hour. In a bowl, combine all ingredients for filling and season to taste. Divide dough in half, then roll out one half (keep remaining dough covered with plastic wrap) on a floured surface with a floured rolling pin into a 15- by 10-inch rectangle, then cut into 5 inch rounds. Add ¼ cup of filling to center of cut rounds leaving a 1-inch border, and moisten border with water. Fold dough press edges together to seal. Roll edges and use fork to form a decorative rim. 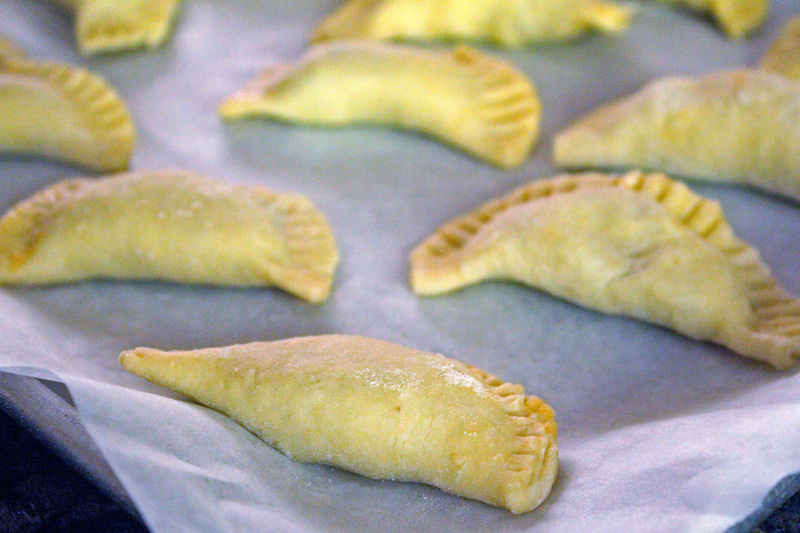 Beat egg with tablespoon of water and brush other each empanada. 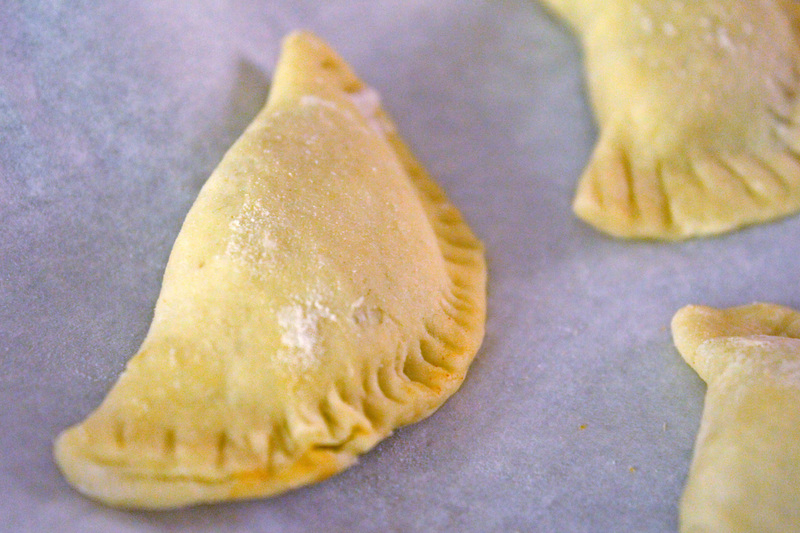 Bake empanadas for 25 minutes, then increase heat to 400°F and cook for 15 minutes more until crust is golden brown. Remove from oven and cool for 10 minutes. 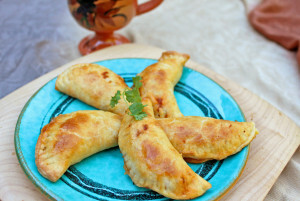 This entry was posted in Appetizers, Cooking, Fall and tagged Cheese, Pork, Spanish by cfaust. Bookmark the permalink.